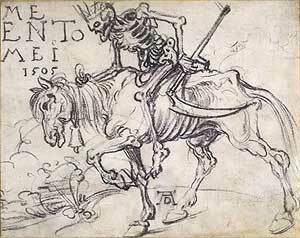 1. the state of equilibrium or inactivity caused by opposing equal forces. It’s a word I’m mildly obsessed with, since it’s a state I find myself in probably too often. I don’t normally post things without analyzing them a bit more, but wrote these at work and needed to exorcize them as it were. So, how do you break stasis and regain the impetus to movement? Some more about the Impressionist chrysocolla (and its sisters). The fantastic Dusty found two slabs of chrysocolla amongst other treasures in a thrift store and had one cut into cabochons. 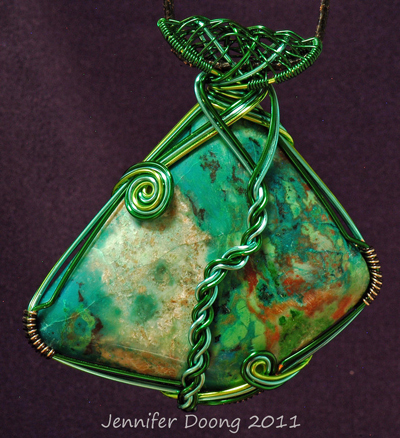 She sent pieces from the same slab to a few different wireworkers. I thought it’d be fun to show several pendants in different styles that were not just from the same type of stone, but from the same original slice. I wrote about my nympheas piece the other day. Here’s the one of the pieces Dusty made from her fabulous find. And the third beauty by the always elegant Krista. 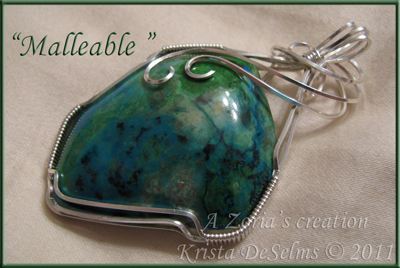 Chrysocolla is a copper silicate. Because of the copper its colors stay in the green/blue range with occasional black or brown inclusions. Unsurprisingly for a silicate it is often described as having a glassy luster. (Sometimes it’s unflatteringly described as greasy.) It is a relatively soft stone without much of a solid structure. It can be a pseudomorph, like pietersite, replacing other minerals that have been dissolved away. 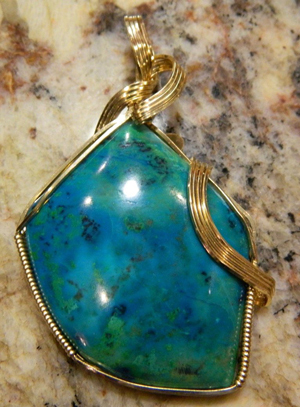 Chrysocolla is often associated with other copper ores like azurite, malachite and limonite. 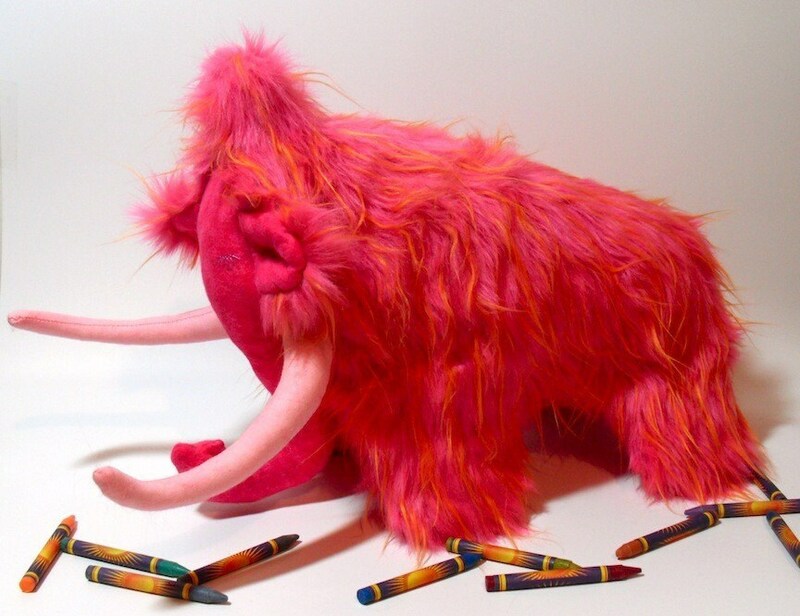 Thomas Jefferson is credited with being one of the first people to use mammoth as an adjective. While he might not have coined the usage, he was certainly integral to its popularity. Mastodon fossils had been found in the United States, well, before it was the United States. In 1705 some large teeth had been found, which Puritan clergymen attributed to a race of giants destroyed in Noah’s flood. In 1799 workers found large bones while digging on a farm in the Hudson River Valley. A number of local people started pulling bones out of the ground and housing them in the granary. Interest in them waned for a year or so, but eventually news spread to the American Philosophical Society and through them to not just yet president Thomas Jefferson. Jefferson sent his friend Charles Willson Peale, the artist and creator of the first American art and natural science museum, to investigate. He was officially there to draw the fossils, but soon decided to acquire them and the rights to look for the rest. He eventually managed to get nearly a full skeleton, and in 1801 brought it back to his museum and gallery in Philadelphia. He spent months reconstructing it with the aid of naturalist Caspar Wistar. Years later Jefferson would have William Clark to continue the hunt for mammoth bones in the Hudson River Valley and elsewhere, partially in the hope of finding the parts missing from Peale’s skeleton. The Cheshire Mammoth Cheese was a gift from the town of Cheshire, CT to Presisdent Jefferson. In a letter Jefferson described it as being 4’ 4 ½” in diameter and 15’ thick and weighing 1230 pounds. The gift was both instigated and delivered by pastor Elder John Leland as a thank you from the local Baptist community to Jefferson for his stance on religious liberty and sustaining the division between church and state. The cheese was too big to be transported on a wheeled vehicle, so Leland brought it from Cheshire to Washington DC by sleigh. I’m reading an excellent book by David P Clark called Germs, Genes, and Civilization. I like histories and epidemiology, so the two mixed together are right up my alley. It has several interesting aspects, mentions some things that ought to be obvious and yet are not really so self evident, and has a few really fun theories about plagues in Ancient History. Unfortunately it also hits fairly regularly on one of my pet peeves, which is a recurring issue in popular books on plagues and disease. It’s an English language geek one, so probably sounds pretty silly to most people. One book I took out from the library used decimate in place of destroy approximately every five pages in a chapter on bubonic plague. I couldn’t take it anymore and brought it back to the library unfinished. The problem is that it still holds its original meaning but is also in the process of that terrifying change whereby if enough people use a word incorrectly it eventually takes on the incorrect meaning. This problem becomes especially confusing when the meanings are a distance apart rather than a matter of nuance. For example, in one part of the Clark book he was discussing about the decrease in virulence of a specific disease over time. On one page he refers to plague decimating the city, then the next page he points out that a few hundred years later it only killed one tenth of the population. Contrasting a word against its original (true) meaning doesn’t give any meaningful data or even a fair impression of the numbers we’re dealing with here. Besides, if even super villains can get it right, surely academics can too?